Manufacturers, Suppliers and Installers of Quality Fencing Panels, Wooden and Concrete Posts and Gravel Boards, Logs sold by the bag, and a wide variety of Fencing Tools and Accessories. Welcome to the T.E.H. Fencing Supplies website. T.E.H. Fencing Supplies is from Congleton in Cheshire, and supplies most types of material for garden fencing. The pages of this web site contain information about wooden and concrete fencing posts, gravel boards or bargeboards, wooden fencing panels including waney lap and heavy duty waney lap and vertical close board (VCB) fence panels. As the picture above shows, our most popular fencing panels, are either VCB or Vertical Close Board, Waney Lap or Heavy Duty Waney Lap. 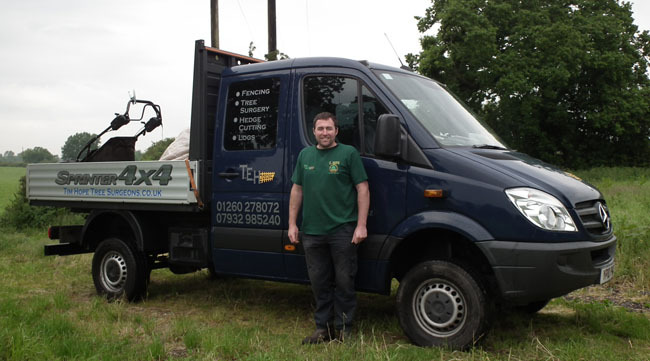 The picture above shows Timothy Eric Hope (hence T.E.H Fencing Supplies) with the main vehicle. This is a very special vehicle, which is believed to be the only one of its type in the Country, with four wheel drive giving off-road capability for those difficult to reach fences. We would love to know whether you have found us from our various websites, or referral from a satisfied customer. Tim will usually come to see you to price your job, and will always be on-site at some point to ensure quality control. Please use the contact details at the foot of each page, or on our Contact Page. 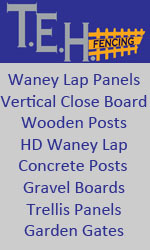 The traditional waney lap panels are the cheapest of the range, double framed and capped for extra strength. These fencing panels are also referred to as waney overlap panels or larch lap and are usually dip treated. This means our panels will last for years if treated on a regular basis. The heavy duty (HD) waney lap panels are highly recommended, being made of 3/8 inch thick horizontal boards fully framed and capped and dip treated. Stronger than the traditional waney overlap panels, this sort of fencing will last for many many years if treated on a regular basis. They are available in standard sizes and we recommeded installation using wooden posts or concrete slotted posts and gravel boards for a longer life span. This means later down the line you do not need to replace the whole fence, just swap the panels for new ones. Concrete fencing posts are slotted to take a variety of wooden fencing panels, but your fence can be made up of gravel boards finished with the top panel having balustrade effect for greater security. T.E.H. Fencing Supplies is based on the border of Stoke on Trent in North Staffordshire and Congleton in Cheshire. Our area of operations cover Staffordshire, Cheshire, parts of Derbyshire and Shropshire. Alton Biddulph Cheadle Eccleshall Gnosall Leek Madeley Newcastle-under-Lyme Penkridge Rugeley Stafford Stoke-on-Trent Stone Staffordshire. Alderley Edge Alsager Altrincham Birkenhead Bollington Bramhall Cheadle Chester Crewe Congleton Ellesmere Port Frodsham Helsby Holmes Chapel Hyde Kelsall Knutsford Macclesfield Malpas Middlewich Nantwich Neston Northwich Poynton Prestbury Runcorn Sandbach Stockport Tarporley Warrington Widnes Willaston Wilmslow Winsford. If your town is within the area indicated but not mentioned, or you live just outside the areas indicated please call us, we will try to help.